Geraniums in container gardens are one my favorites. Lots of gardeners must agree with me as they are one of the top ten favorite annuals in the United States. Some people think of geraniums as old-fashioned, but nothing beats them for lots of color and pretty foliage. 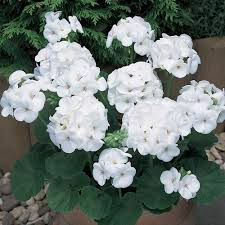 Geraniums, or pelargoniums, which is their scientific name, come in all kinds of colors – white, pale pink, deep rose, coral, salmon, red, and variegated. The plants grow upright with clusters of blooms at the tips of their stems. Geraniums also come in vining varieties that are especially nice for hanging baskets and window boxes. The foliage of geraniums is rounded, with ruffled or scalloped edges. The leaves are somewhat fuzzy to the touch so they add nice texture to your container gardens. Their color is generally dark green although some types have variegated leaves of green and white. 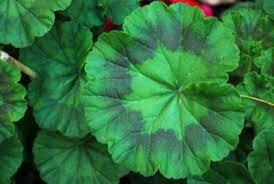 Ivy geraniums have glossy, smooth leaves that resemble those of the ivy plant. Some interesting history about geraniums – they were once considered an exotic flower. All of the geraniums we enjoy now came from plants in South Africa. 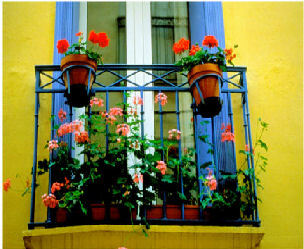 Thomas Jefferson began growing geraniums in 1760 after he learned of the beautiful plants while visiting Paris. 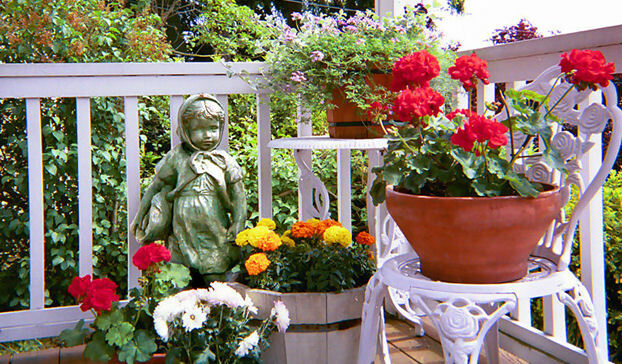 With a little care, geraniums in container gardens will bloom all summer into fall, up until the first hard frost. To encourage repeat blooming, pinch off the spent blooms or withered leaves. Just use your finger tips or a small garden shear. The plants prefer well draining soil, so use a light soil mixture with some slow release granular fertilizer added to it. Set your geraniums in a sunny spot and water them when their soil becomes dry to the touch. Don’t let geraniums sit in standing water – if you like to use saucers, empty them every time you water or after it rains. Geraniums in container gardens can be grown all year in warm climates, but for most of us, they will die after the first hard frost. Bring your plants indoors before then and set them in a sunny location. Water them about once a week. In early March, cut the plants back to at least half of their size. This encourages good blooming in the spring. When new growth starts, add some water soluble fertilizer to your watering routine. Once the threat of frost has passed and the days begin to warm, move your geraniums in container gardens outdoors. Over the period of 10 days to 2 weeks, leave the plants outdoors a little longer each day. Start by setting them in a sheltered, partly shady spot. Let them get used to being out in the open where wind and sun are different than where they have been indoors. At the end of this acclimation period, set your containers where you want them to stay and leave them out all the time. You can also plant the geraniums in the ground now if preferred. Moving geraniums from inside to the outdoors without an acclimation period may kill or damage your plants for a new growing season. Geraniums are one of the easiest plants to multiply by taking “cuttings”. Cut a 4 inch stem from the top of a healthy, blooming geranium in early fall. I would do this in August just to make sure you get good cuttings before an early frost might come along. Take all the lower leaves and any buds off of the stem until you have a stem with just a few leaves at the top. Let the stem dry for a day or so. It will callous over on the end where you made your cut. Plant the stem in a little pot of potting mix and water it. Many gardeners dip the stem in hormone growth powder before planting to encourage root growth, but it’s not necessary. Place the little plants in a sunny spot, but not in direct sunlight while they grow. When new growth starts to appear, add some water soluble fertilizer at about half the strength recommended and use it when you water. After the threat of frost has passed, plant your new geraniums in your containers and move them outdoors, Follow the guidelines for acclimating to the outdoors as described above.